Stained glass can impart a unique touch of class to any space thanks to its intricate craftsmanship and vibrant colours. Still made using traditional methods passed on from the medieval period through generations, stained glass installations can transport you to the bygone era in an instant. Lawrence Leadlights specialise in stained glass works, and we’ve built a reputation for high quality craftsmanship. Each piece commissioned is designed, built and installed to last for years to come. We create traditional and contemporary stained glass artworks for organisations, corporate as well as residential customers. Every year, we work with businesses, government organisations, churches as well as homeowners to design, build and install beautiful pieces. We also provide repair and restoration services for your existing stained glass works. We can help you choose from a wide range of unique hand painted, leaded, faceted or sculptured gold windows and doors that are steeped in tradition and high quality workmanship. Each piece of glass fixture – be it a window, door a cabinet – is custom designed to suit your requirements. We work closely work with our clients right from the initial conception to the final artwork to create a unique and distinct masterpiece. We then manufacture it in our state of the art studio using high quality raw materials that ensure longevity, durability and quality. With a keen emphasis on energy ratings and sustainability, we offer a wide variety of solutions including double glazing and triple glazing to ensure the elegance of stained glass can be enjoyed in the most energy efficient manner. 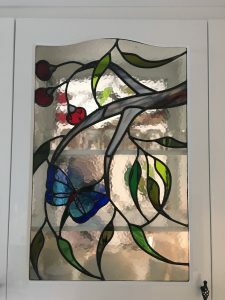 Our fully qualified, well trained and highly experienced tradesmen install our stained glass pieces while meeting the highest standards of workmanship and stringent safety standards.